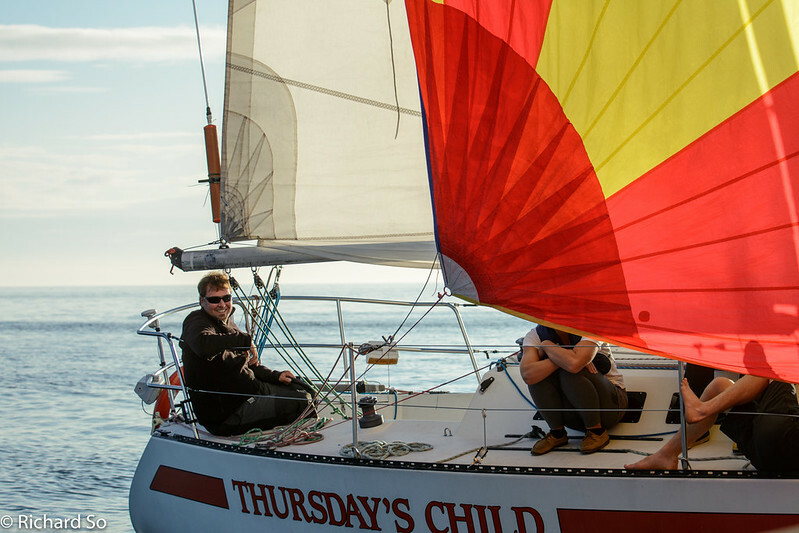 The Fraser River Lightship race is a classic fall distance race in Vancouver. 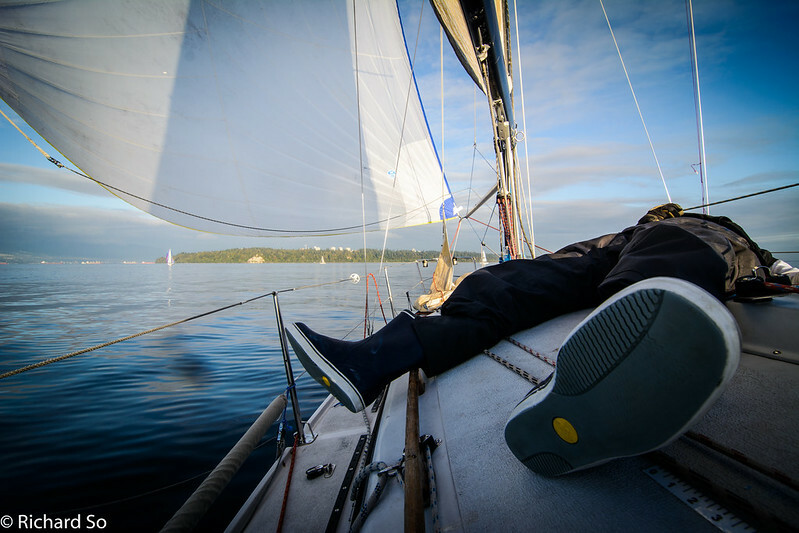 In the local sailing calendar, most of the distance races take place in the spring, followed by a summer of regatta racing. 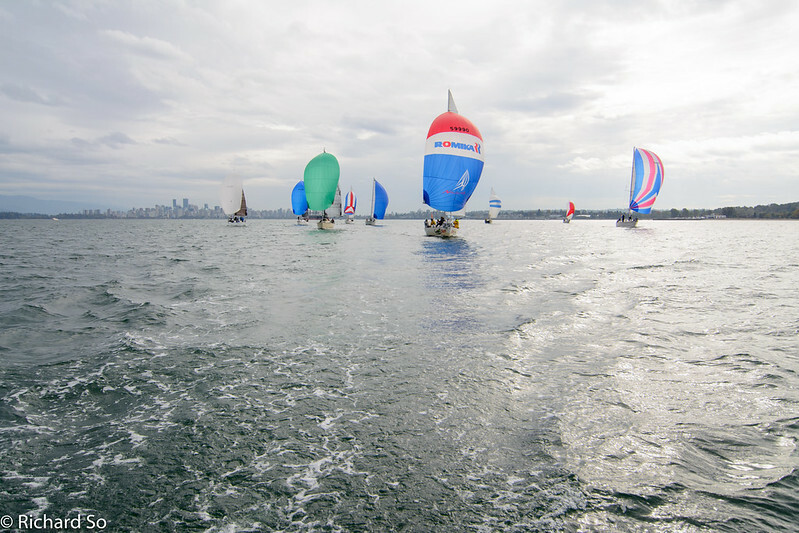 Depending on the wind conditions, it either starts off Royal Vancouver Yacht Club if the wind fills in English Bay, or further out west to the Point Grey Bell Buoy if there's not enough wind to start a race off inside English Bay. Being Vancouver and English Bay, that usually means the former. This was actually my first ever race with the crew of Ultraman, starting with two light air races in 2013 and 2014. I missed the race in 2015, the first in recent memory when the race did not finish after sunset. 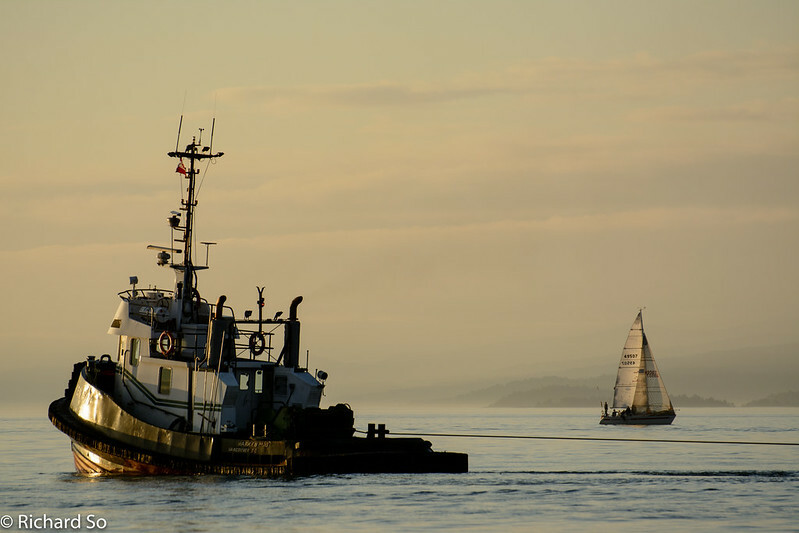 After sailing around Point Grey, boats sail south, either rounding the T10 buoy on the short course, or down to the namesake Fraser River lightship buoy a few more miles to the south. The course is shown in the Navionics webapp screenshot below. Red line out, rounding the Point Grey bell buoy to port, leaving the T10 bouy to starboard, Point Grey bell buoy to starboard and finishing between a floating mark and the RVYC breakwater. It's roughly 19nm, hardly a distance race in comparison to the Vic-Maui feats of some of the Ultraman crew. 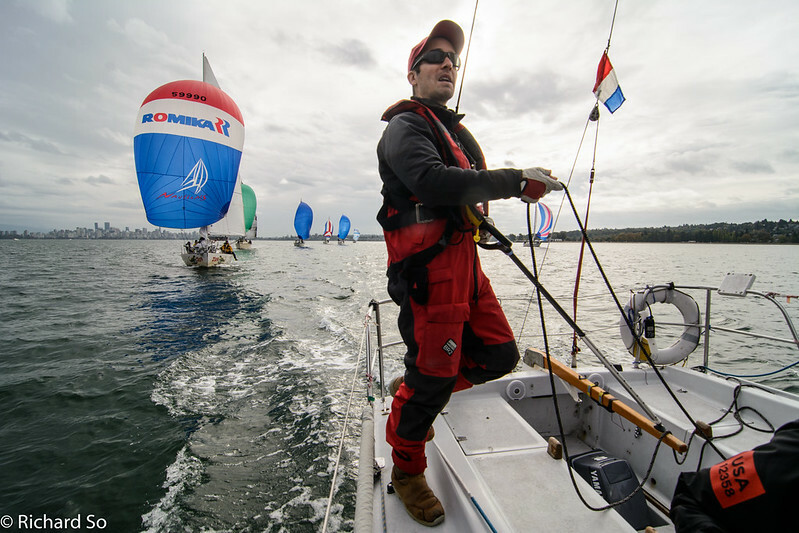 The 2014 edition of the race was a very light wind affair. 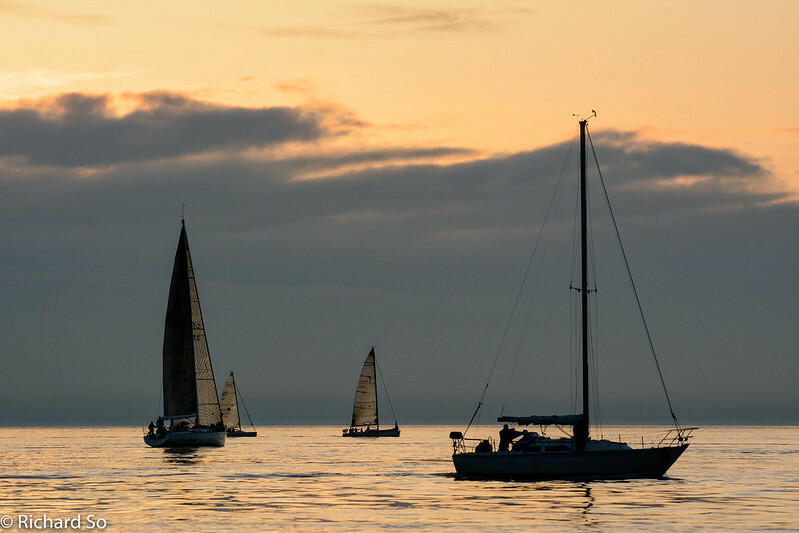 Without enough wind to start in English bay, the fleet moved out to the bell buoy off Point Grey. 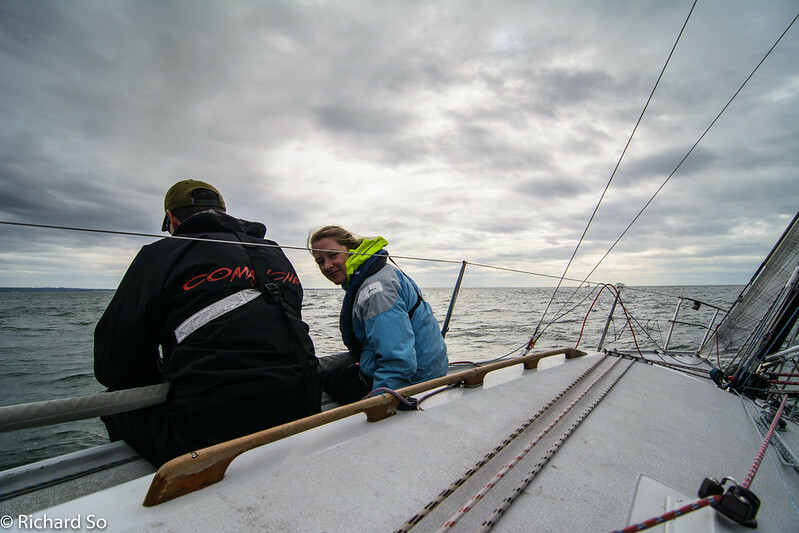 It was very light wind, but there was just enough to get us down to the rounding mark. 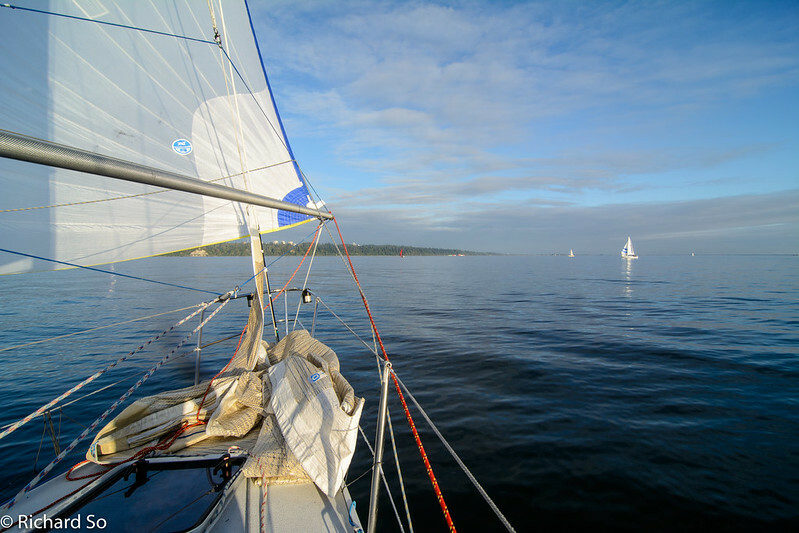 On the way back though, the fleet struggled to keep the spinnakers filled. 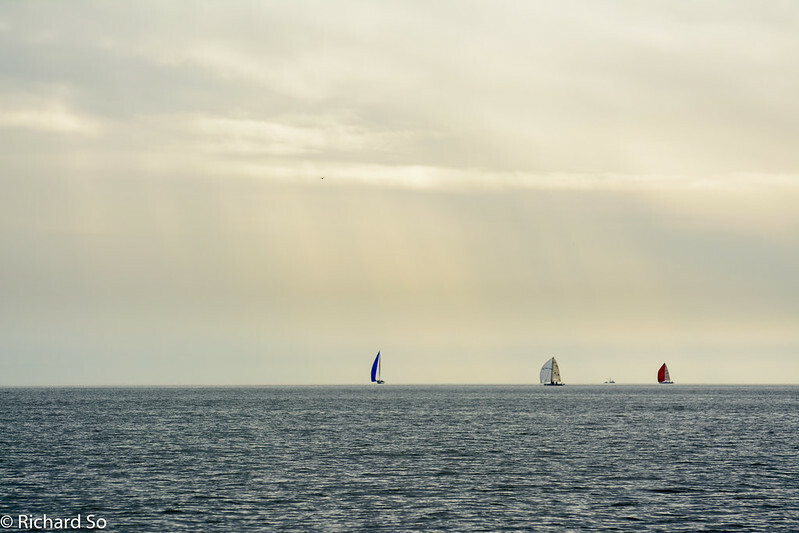 Over the VHF radio, boats announced their retirement from the race as it looked like the wind would shut off for the evening. One of the boats, Reacher, had finished in our division shortly after 8pm, pulling way ahead of us on the way back from T10. 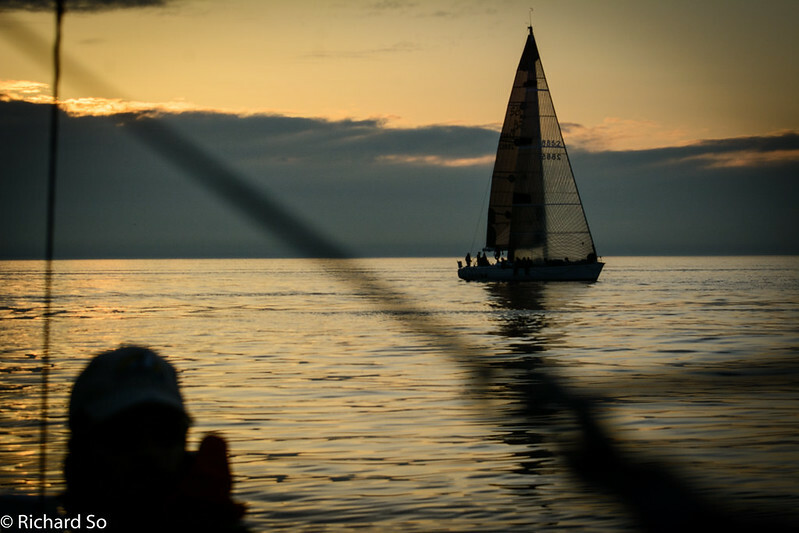 The sailing instruction for the race will usually state a time, that if no boat has finished by, then the race is abandoned. But some of the bigger boats did finish by 2000hr in the other Division, so we continue racing with the hope of getting a result in this race for the overall season scoring. The sailing instruction was subseqeuntly changed at least for 2016, with an abandonment if no boats had finished by 1700hr. 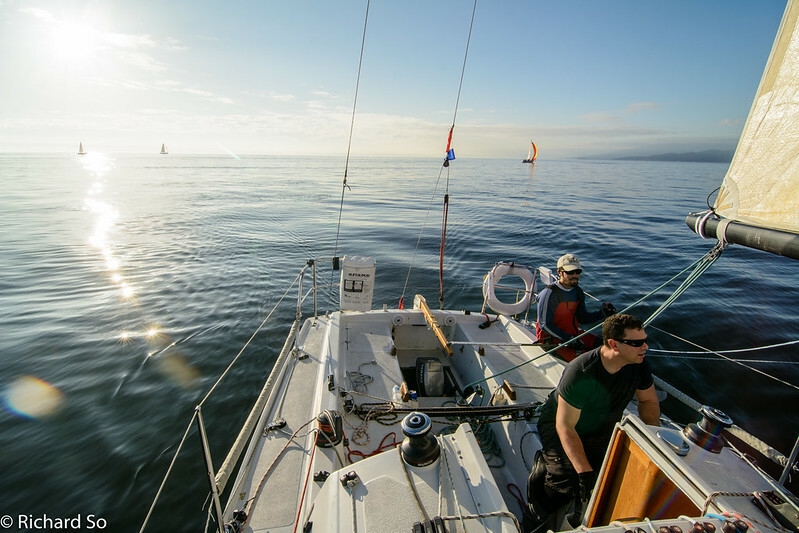 We "sailed" as long as we could, but after sunset, off Point Grey, we looked at the GPS, showing our estimated time of arrival well after the cutoff of 2300hr. We motored in, passing the one other boat in Division 3 that was still racing, Natural High. It's unlikely we would have caught up to them under sail. They finished with under fifteen minutes to the cutoff. So despite a good effort from the crew, Ultraman II did not finish the Fraser River Lightship, ran out of beer, but did make it back to the yacht club in time for the last order of prime rib. Sailing off Sturgeon Bank, when there was still wind heading south. 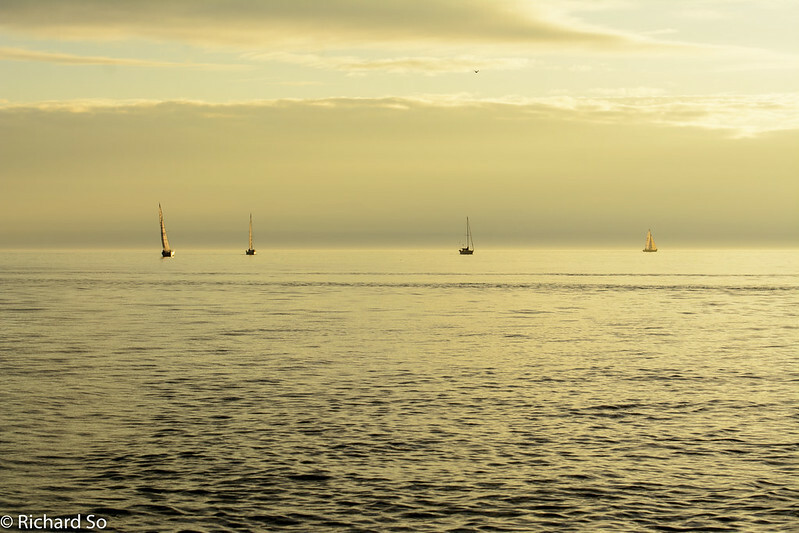 Some boats choose to stay further offshore to find more winds. Thursday's Child. Now heading north, somewhere off Iona Beach, going nowhere in a hurry. Definitely calm that day on the water, with the light air asymmetrical sail hoisted. We are going nearly perpendicular to our course here. Putting in some distance from Thursday's Child by heading closer to the shore. Passing Natural High at 9pm. We had motored for 30 minutes to catch up to them here. Drifting into the finish, over an hour and a half later. I missed the 2015 race, when Ultraman II finished first across the line, in under 3 hours. Conditions were looking good again this year. 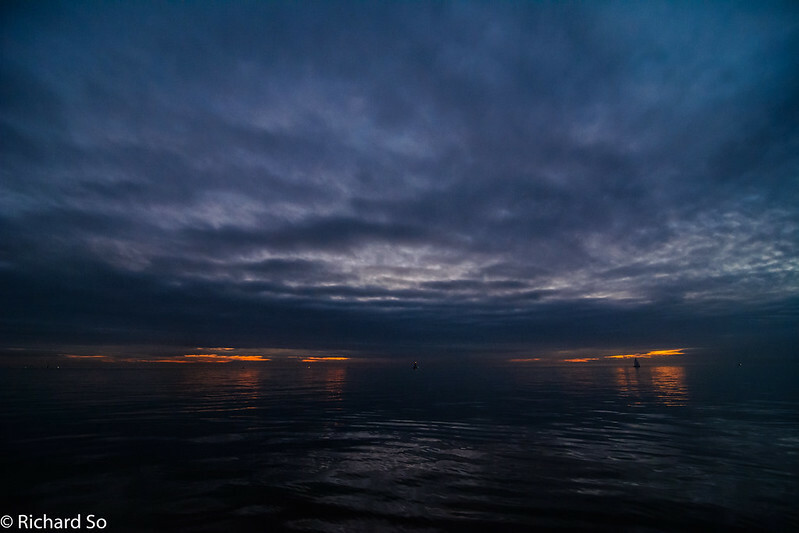 The forecast was for easterlies, light in the bay but gusting up to 20 knots out in the strait. The tide was going out until noon, helping us out of English Bay. We had a good start, leading the Div 3 fleet out of English Bay in the light breeze. 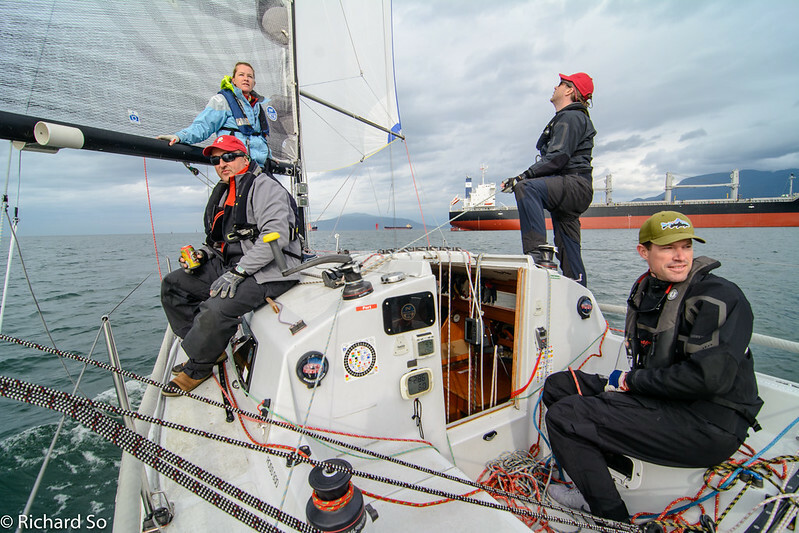 Less than ten minutes into the race, one of the Div 3 boats, Incisor, ran aground in Spanish Banks going six knots with the spinnaker up. The two red and white pylons (the "Dolphins") mark the exact edge of the Spanish Bank beach. Boats going inside the dolphins usually end up on the sand, stepping off the boat into thigh deep water. They radioed for the Coast Guard for help, as the tide was going out and they would be stuck for a while. 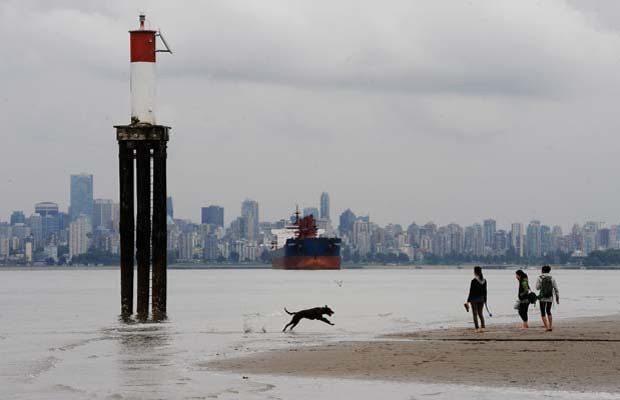 Random image from Spanish Banks. We rounded the Bell buoy and started the southerly reach to T10. 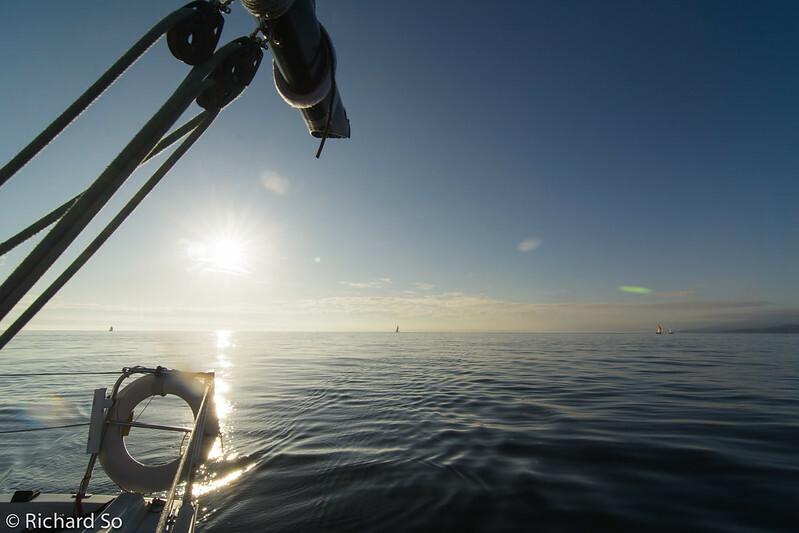 We were barely able to hold the spinnaker, but the wind clocked forward and we were back to the genoa. The wind shifted back again, the spinnaker went back up. But the wind was getting stronger and more forward, so the spinnaker went back down for the last time of the race. With the building breeze over Sturgeon bank, we tried to gear down to the smaller #3 jib while reaching down to the mark with the genoa. 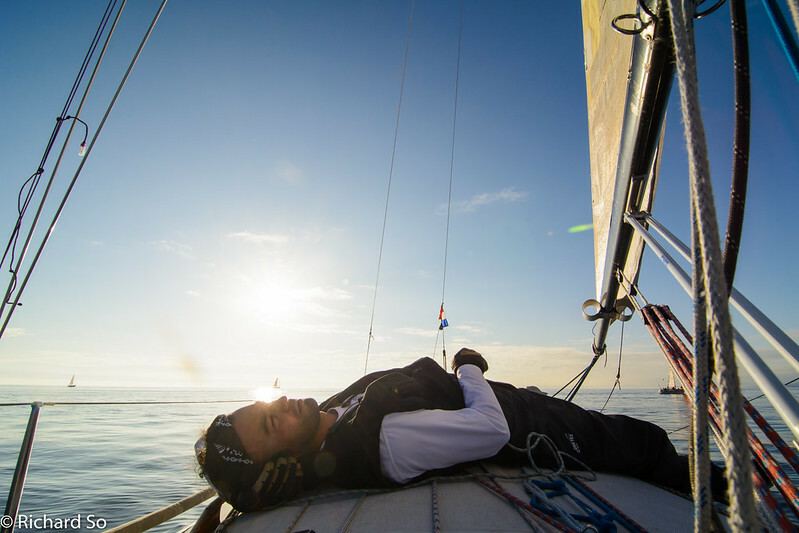 This involves pulling the sail bag up onto the foredeck. 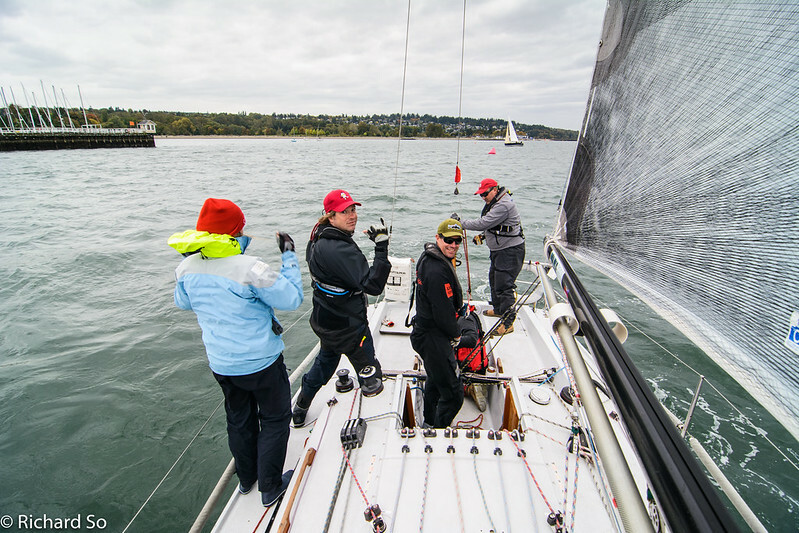 Like most other race boats, Ultraman II is setup with two jib halyards, two sail tracks in the forestay foil, so it's possible to hoist/lower sails nearly simultaneously. It's harder than it sounds though when you're trying to connect a sail up there, trying to hoist the new sail outboard of the current sail, while the boat is way overpowered and heeling over, with waves crashing over. It ended up being a botched attempt at an outside peel and we held the genoa all the way to the T10 rounding mark. We gybed around the mark. Now the free starboard track was on the inside and we could easily hoist the #3 inside of the genoa. 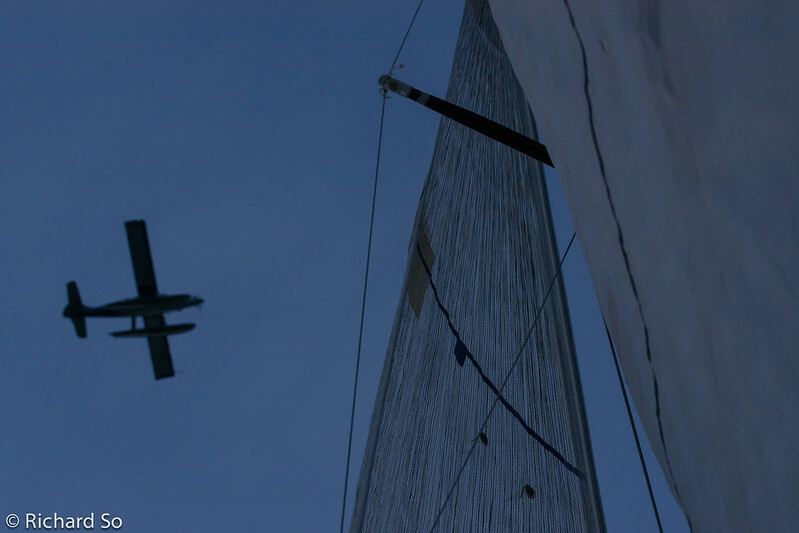 With the #3 up, we continued to lead the fleet, despite having Hurricane right up our hip. 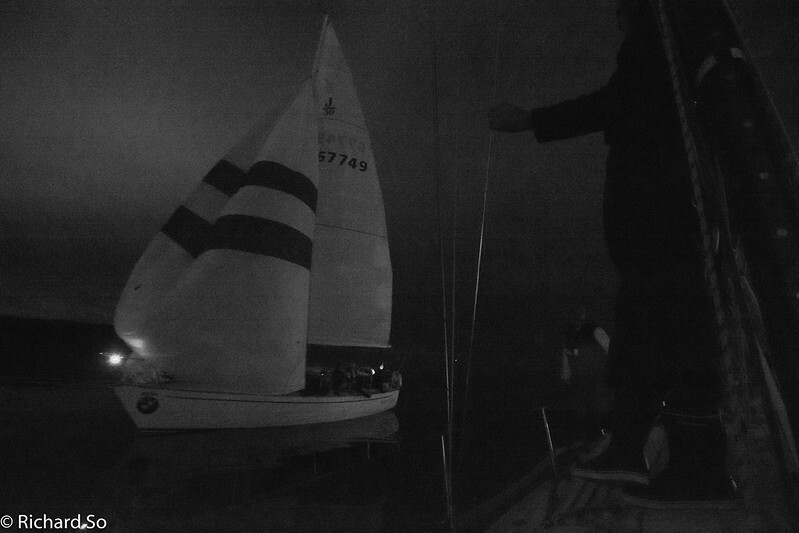 We were now match racing, both boats with the same rating. First boat across the line wins. Krikkit was the third boat, too close for comfort. Despite being six feet longer than Ultraman II, Krikkit has a slower rating. We were never able to shake them off throughout the day. Going into English Bay, the wind lightened up. The genoa went back up, this time we pulled off the outside hoist. Note to self, it's easier doing an outside peel with a smaller sail up, in lighter breeze. We kept an eye on the Dash 34, tacked when they tacked. For the second year in a row, Ultraman II had line honours (first across the line) but we lost to Krikkit by 2 seconds, placing 2nd out of 10 boats in Div 3. With a good result from the day, Ultraman II is now leading the Div 3 in the VARC Overall results. Nice work team! Andrew and Ultraman II leading the Div 3 and 7 fleet out of English Bay. 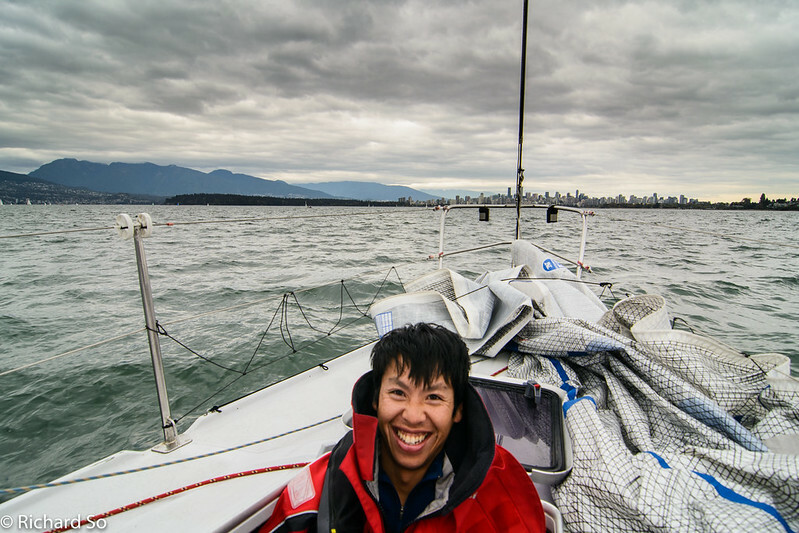 Sailing out of English Bay in a light breeze with the S2 up. Our main rivals behind us. The green kite is Krikkit, an Abbott 36 that would beat us by 2 seconds in corrected time. 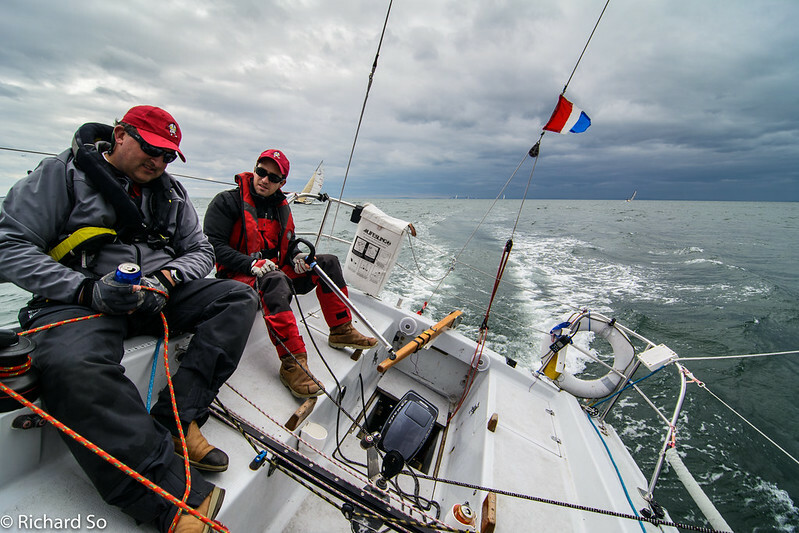 Skipper and Andrew handling the boat in 15-ish knots, with a few boat lengths in front of Hurricane, a Dash 34 with the same PHRF rating of 100 as Ultraman II. 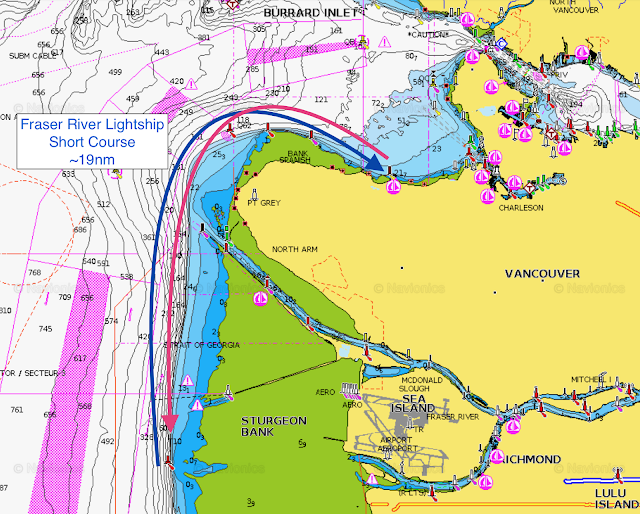 Line honours in Div 3 for the Fraser River lightship. The finish line is between the orange flag off the RVYC dock and the triangular inflatable on the right. This is where I spend most of my time as the bowman on Ultraman II. Thanks for taking the photo Margaux! It is Schwarzenegger Schwarzenegger candy of red, blue and two assorted the image of a color timer, which is a feature of Ultraman. 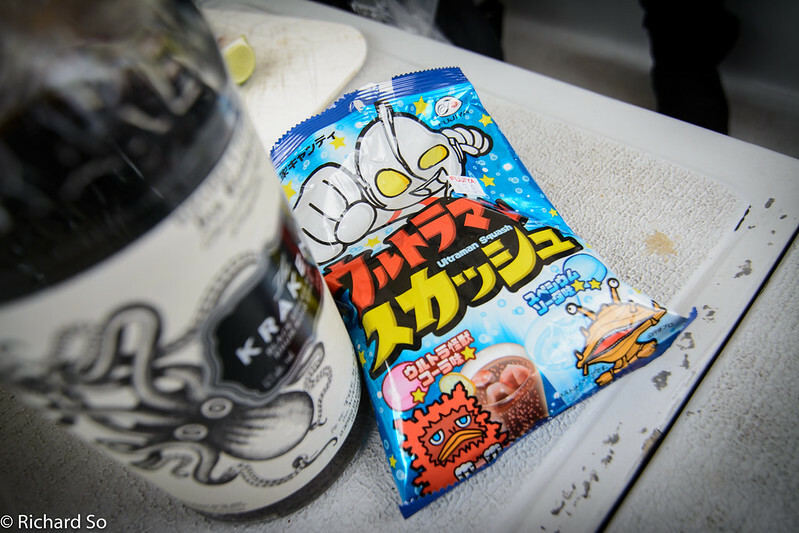 Red (crisis situation) is expressed as "Ultra Monster cola taste", it was blue (normal time) is expressed as "Supeshiumusoda taste". Outside cola and soda taste of candy, the center has a two-layer structure in the candy fabric of the foam type and Shuwashuwa. You can enjoy two kinds of popular cola taste and soda taste for children.